JPMorgan hosted its annual "Gaming, Lodging, Restaurant & Leisure Management Access Forum," which included C-level presentations and participation from some of the biggest restaurant chains. After the event, the firm felt it appropriate to turn bullish on Domino's Pizza, Inc. (NYSE: DPZ) and downgrade Yum! Brands, Inc. (NYSE: YUM). JPMorgan's John Ivankoe upgraded Domino's from Neutral to Overweight with an unchanged $270 price target. The analyst simultaneously downgraded Yum Brands from Buy to Neutral with an unchanged $94 price target. Domino's management guided towards 8-12 percent system-wide sales growth, 6-8 percent unit growth, 3-6 percent comps growth in both the United States and international markets, which Ivankoe said are reasonable. The growth rates are superior to Yum Brands' growth outlook, which calls for system-wide sales growth of a mid-to-high single digit, 4 percent unit growth and 2-3 percent worldwide comps. Domino's also boasts strong unit economics with a payback period for U.S. stores at less than three years, the analyst wrote in a note. The company's status as offering one of the cheapest food delivery options per person supports not only continued unit expansion, but justifies the cannibalization of new store openings in existing trade areas. 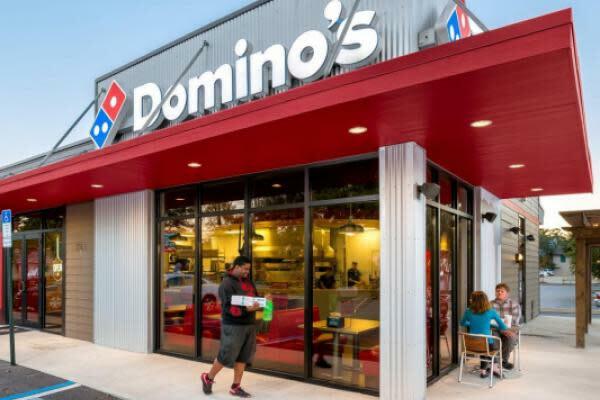 About 74 percent of Dominos' operating income in fiscal 2018 came from the superior U.S. market versus just 43 percent for Yum Brands. Shares of Domino's were trading higher by 2 percent Tuesday, while Yum's stock was marginally lower.